You are here: Home / News / The end in sight? After several weeks of deliberations, there are indications that the General Congregation might be coming to a close soon. Tomorrow Saturday, November 12, members of GC 36 will be joined by many other Jesuits living in Rome, as well as friends and collaborators of the Society in celebrating the Mass of Thanksgiving at the Church of Saint Ignatius in Rome. The members will then gather at the Gregorian University for a social interaction with other Jesuits, as well as to celebrate the 68th birthday of Father General, Arturo Sosa. The General Congregation has no set date for closing, but most of the aula work is coming to an end. 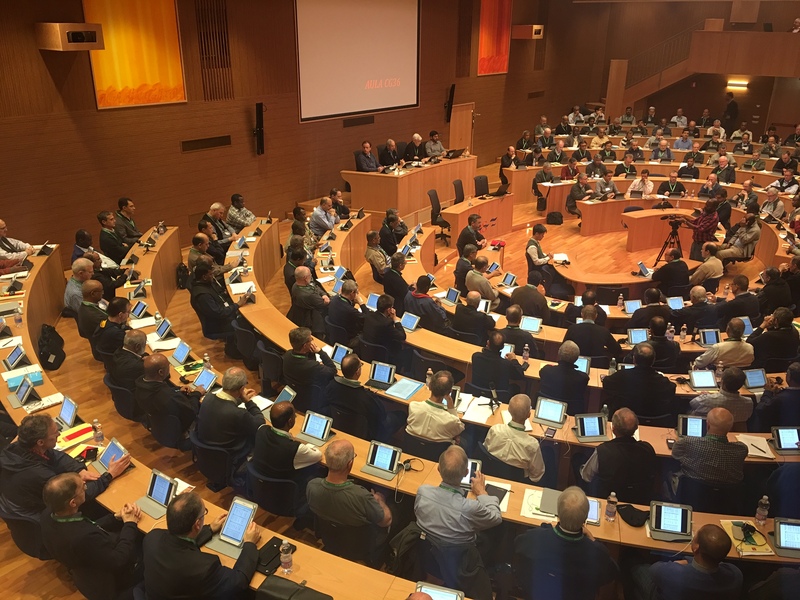 When members are satisfied that they have taken care of all the interventions in the Aula, a proposal for a vote to close the congregation will be made. Until then, the congregation continues. The moment is close. Part of the closing ceremony of the General Congregation will involve members of the Congregation, in the aula, singing the Te Deum Laudamus, in gratitude to God for the graces of GC 36.